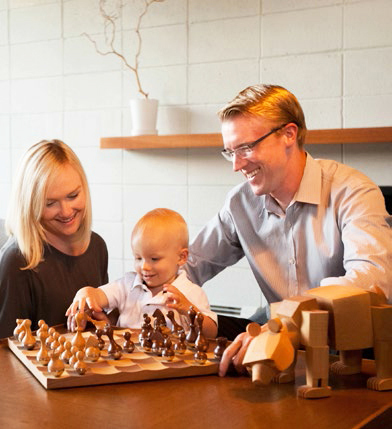 The Blaine family (architects Keith and Megan and baby Henry - above and top) are among the newcomers with children who now call the Morepark Eichler neighborhood home. The Blaines' early Anshen and Allen model—"one of the most soothing places I had ever been in," Keith says. Even today the neighborhood is still seen by some as a bit on the wrong side of the tracks. "Because there are a lot of apartment buildings surrounding us, it doesn't feel as homey as the neighborhood we moved from," Elyse says—a Long Beach tract of modern homes designed by Cliff May and Chris Choate. Residents of the apartments tend to be Latino and poor, says Price-Jang, who knows their community well. Burglaries and vandalism remain concerns in the Eichler tract, though the number of burglaries has gone down, say Adam and Apolonia Dye, who arrived six years ago. Break-ins were common then, Apolonia remembers. The creation of a neighborhood watch and a neighbors email tree have helped, she says. In many ways, though the location is great—near three freeways, minutes to a light rail station, not far from cheery downtown Campbell. It is also walking distance from the excellent Sherman Oaks School, where the Dyes' daughter, Xochitl, is already conversant in Spanish thanks to a dual immersion program. Their son Conor will attend in a couple of years. Mothers in the neighborhood often get together and walk their children to school. More than most Eichler neighborhoods, Morepark (the name has not been in regular use at least since the early 1960s) hides in plain sight. The homes, arrayed along three long, parallel blocks, can scarcely be seen by drivers hurrying along the busy, adjacent Fruitdale Avenue. "You can't tell it's an Eichler neighborhood unless you venture down the street," Apolonia says. 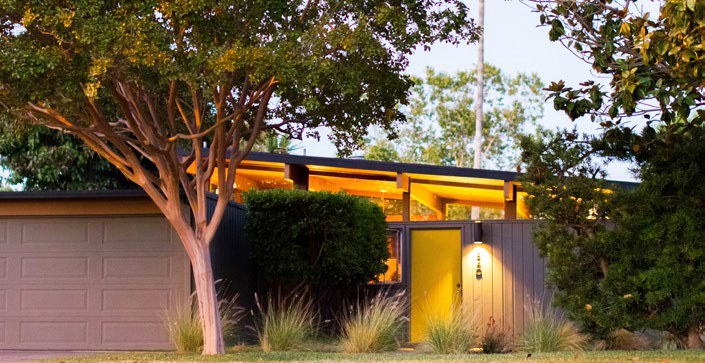 If, in a way, Morepark is an Eichler neighborhood that has been forgotten, that's been a good thing. Many of the homes remain essentially intact, both outside and in, with their warm mahogany paneling, steel sliding doors (this is the pre-aluminum window era), and wooden mullions holding in place the rear walls of glass. 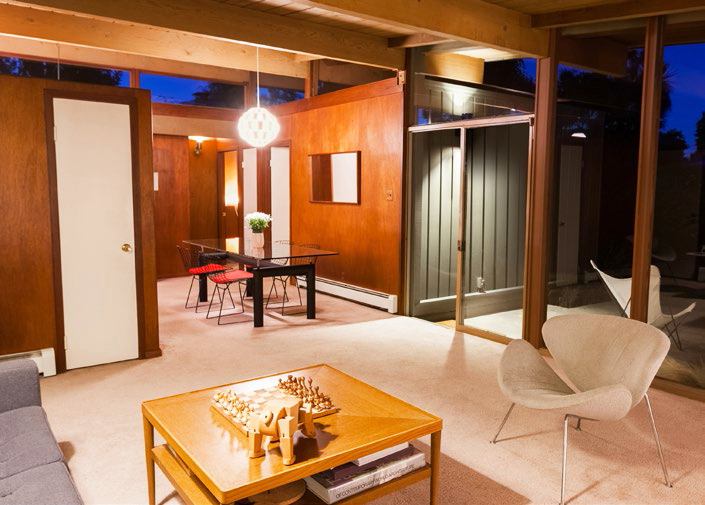 Unlike later Eichlers, which mixed mahogany paneling with drywall inside, here mahogany is used throughout, usually in every room. Only one house has gotten a second story, Karina Marshall says, adding that another that had been given a peaked roof was restored by a new owner, who had the roof removed. One home, amusingly enough, has had Greek columns added to its garage and entryway. 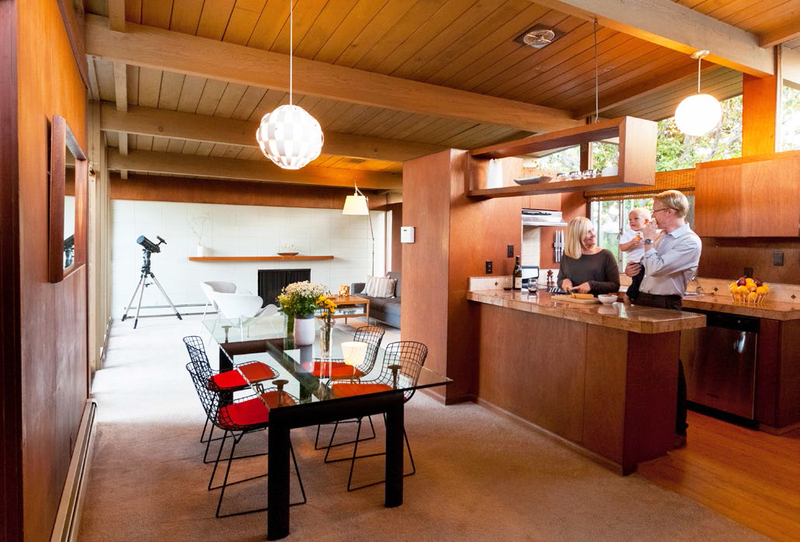 "This neighborhood has a lot more original [houses] than most," says Elyse, who knows, because she visits open houses at Eichler tracts throughout the area. And that fact isn't lost on the mid-century modern fans who are falling in love with the homes in Morepark and moving in. "It's been interesting to see the progression of the neighborhood since we've been here," says Adam Dye, who was among the first young families to move into the neighborhood. "There are a lot of younger families," his wife Apolonia adds. "And people have been taking better care of their homes in the past four years."